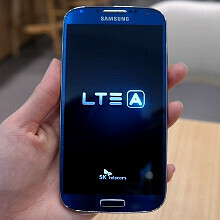 We've been hearing about the "faster" Samsung Galaxy S4 with a Snapdragon 800 chipset that supports LTE-Advanced connectivity, and even learned this morning that it might launch as soon as this week, since the Korean carrier SK Telecom will be ready with its LTE-A network ahead of time. Well, that rumor seems to have held water, since a few pictures of the Galaxy S4 LTE-A, in and out of its retail box, have appeared online, displaying the blazing fast handset for the world to see, and in cool Blue Arctic and Red Aurora versions at that. Have a looksie in the slideshow below, and feel for the pain of those Koreans that just bought the "slow" version. The blue version looks really nice. The international non-LTE version of the S4 with Snapdragon 800 can't get here soon enough!! If it ever comes to the states and is offered through T-Mobile, I'll buy it the second the store opens. Article Blue look better than the Pebble Blue used on the GS3 imo. Actually, it's ARCTIC blue. If you're going to correct someone, you might want to actually be correct. you have a 4k tv? You have a monkey on your back? What will be the next s4 variant? Wow Both Colors Are HOT .. True, I hope the NOTE III will come in Artic Blue. Dark Blue is better, at night it looks black. Still ugly!! My lumia is better and more beuatiful! Better than artic blue gs4? Not even close. L LOVE THAT BLUE IT LOOK COOL!! !